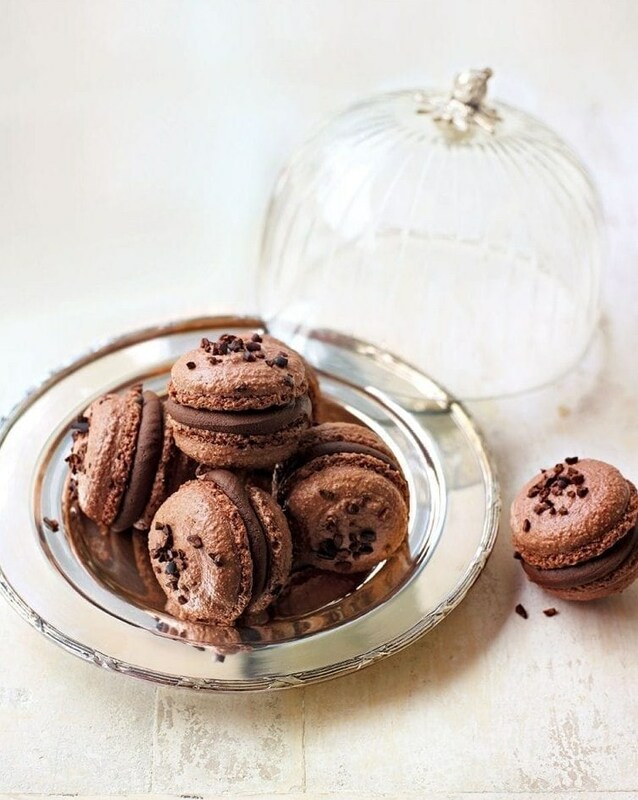 Eric Lanlard’s rich, decadent take on classic French macaroons are just as good with your afternoon tea as they are for dessert. Start by making the filling. Melt the chocolate, butter and cream together in a heatproof bowl set over a saucepan of barely simmering water, making sure the surface of the water does not touch the bowl. Stir until smooth, then cool at room temperature until the mixture has thickened and has a piping consistency but isn’t hard. Meanwhile, make the macaroons. Line 4 baking sheets with baking paper. Put the icing sugar, ground almonds and cocoa powder into a food processor and grind to a very fine powder. Sift the powder into a mixing bowl. In a separate, clean and dry bowl, whisk the egg whites to soft peaks, adding the caster sugar a little at a time. Just before the whites are peaking, add a point of a knife of red food paste (this will enhance the natural reddish colour of the cocoa powder). Using a rubber spatula, gradually fold the powder mixture into the egg whites until smooth and glossy, but not runny. Spoon the mixture into a piping bag fitted with a plain piping nozzle, then pipe 28 discs about 3cm in diameter onto the prepared baking sheets. Leave to stand at room temperature for 15 minutes to allow the tops of the macaroons to start to dry (in France, this process is called croutage). Meanwhile, preheat the oven to 150°C/fan130°C/gas 2. Bake the macaroons for 20 minutes or until the baking paper peels away from them easily. Remove the baking sheets from the oven, then leave the macaroons to cool completely. When the macaroons have cooled, spoon the filling into a piping bag fitted with a plain nozzle. Pipe roughly 2 tsp of the ganache filling onto the flat base of a macaroon, then sandwich together with a second macaroon. Repeat with the remaining macaroons. Store in airtight containers for up to 3-4 days – it’s best not to put them in the fridge as this can make them sticky. Piping the macaroon mix in perfectly round shapes might take you a few goes.